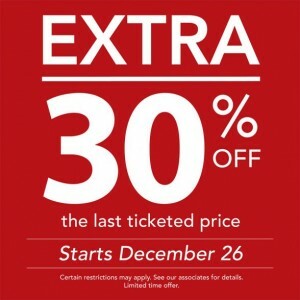 Shop Boxing Day 2013 at Bentley and receive an Extra 30% Off the last ticketed price. Bentley's Boxing Day Canada Sale starts December 26th, 2013. Bentley Canada has certain restrictions that will apply to this Boxing Week sale. See store associates for details. Bentley's Boxing Week Sales and Deals are limited time offer. Purchase luggage, handbags, backpacks, sport and duffel bags, brief cases. accessories, wallets, winter items and more for just a fraction of regular price during Bentley's Boxing Week sales. Check out Bentley's online store here!